Beautiful villa with five bedrooms for up to 12 people, private swimming pool, totally climatized, free wifi and satellite TV with channels in German, French and Dutch! This beautiful villa on the outskirts of Alhaurin el Grande and in a beautiful rural setting has five bedrooms offering a capacity of 12 people. Three bedrooms have a double bed and two bedrooms have two single beds. There is also a double sofa bed in the living room. With two kitchens you can cook anything you´d like in this house. They are fully equipped with kitchenware, crockery and cutlery, oven, microwave, dishwasher, kettle, juicer, coffee maker and toaster. The villa has two living rooms, both with sofas, tables, chairs and beautiful furnitures and decorations. Also, both living rooms have a television. With the satellite you can watch channels in Spanish, German, French and Dutch and feel completely at home. On the plot of 600m2 you find an impressive private swimming pool with sunbeds and umbrellas that can be used by the clients all year around. On the other side of the pool you find the barbeque area with a dining table and chairs to be able to eat outside. There is also a toilet and a shower outside at the pool area. For the children there Is also a swing, so they too can enjoy the best holiday. The villa is located just outside of the centre of Alhaurin el Grande. While you can enjoy the quiet environment, the town with its supermarkets, shops, restaurants and bars is only a few minutes walking away. 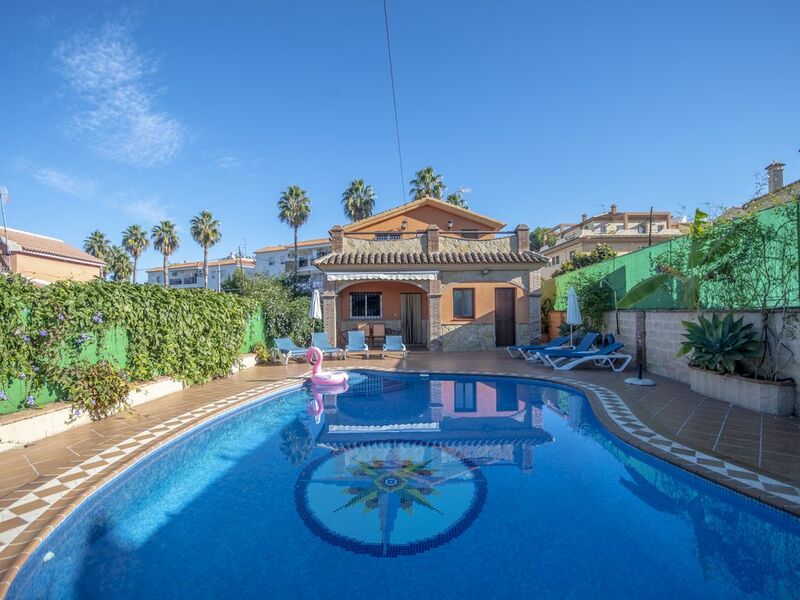 Also located only a short distance from the two golf courses of the town and a few kilometers from the best beaches in the province, as well as emblematic towns such as Marbella, Benalmadena, Mijas, Malaga, Ronda, etc. Completely climatized and free WIFI! The owner (Jose) was very helpful and responsive. Our gas bottle ran out half way through our evening meal. I texted Jose and he actually brought us a new bottle within 20 minutes. We also had a problem where the electric pumps on the pool weren't working. Again Jose came and fixed the problem the next day. The support that Jose provided was excellent. The villas itself was well equipped and the pool was checked regularly. Great villa , very large . All facilities excellent . Al fresco dining area was really good with gas and fire barbeque with lots of seating . Really good value for money . Lovely house with a good location, large house with many possibilities and friendly service, though with a little language difficulties. Before we booked i was worried after reading an earlier review from someone who said they had booked expecting access to the full house but had only had the downstairs. I emailed the owner and was assured that with a party of our size (11 of us) we would have the full house. The house is beautiful. The pool is great and was so lovely and warm during our stay, like getting into a bath! The house is big and clean and well kept. The garden has plenty loungers and chairs and has sun all day but also has a shaded area and a roll down canopy. There are a couple of parasols provided too, but one of these is so full of holes it was useless. The man who met us with the keys came back twice during our two week stay to check the pool chlorine and make sure everything was ok, and brought us some extra bed linen when we asked. The town is nice, we found some good places to eat, los candiles is a 5 minute walk from the house and is great. We drove to a few other nearby towns a couple of times... Alora and las mijas were beautiful. The whole area is very scenic and beautiful. The houses to either side of this house have some noisy barking dogs, but it never bothered us on a night. Overall a perfect holiday. We would come back here in a heartbeat.